I integrated a RTS style squad system into the game. Hit Ctrl + ANYKEY to assign squads and the SQUADKEY to select the squad. This is still in the working and I will add a few more features later. 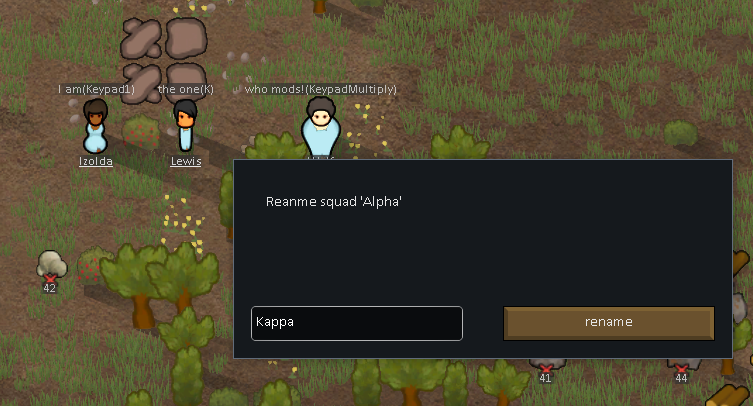 Also squad names are in - RIGHTCtrl+SQUADKEY to rename it. You need to start a new game to use this mod! if you use 1-4 you are overwriting the speed control buttons, either that or it activates both the squad and the speed control button. Either way, this is not something I like to have happen. I recommend only using 5-0. Or you could make it so that ctrl+1 sets the group and shift+1 selects it. I'm not sure if that would cause the speed button to activate still though, haven't tested it just yet. If you mean the keypad to the right of the keyboard then I think that would be an excellent additional area. But some people play on laptops which don't have a keypad to the right so it shouldn't be the only one. I think that letting people know in the OP about the 1-4 buttons would probably be sufficient. I personally would end up using the keypad on the right for my squad assignments cause I use a full keyboard that is just plugged into my laptop or a full keyboard that is wireless when I have batteries for it. This mod is usefull but first to fix it replace the squad keys with F1,etc. or with others,but the keys 1,2, etc are being used for speed time. Squad names soon to come YAY..
A GUI for selecting can also mitigate the keypress issue. It could, but that might cause incompatibilities with EdB's UI mod which a lot of people use. Im rewriting the whole thing at the moment It became unfeasible to expand the whole system as it is now. You know what would be cool? Sounds. Like at all rts games, when you select an squad, and when you send them somewhere. Besides great mod.. will brings the city fighting to an new era! Edit: But i think finding the right soundfiles could be hard.. i mean how do talk the pawns? Like normal humans? Dont think so.. hrm... maybe a bit like the jawas from star wars. 1: Yes sir!= Kla Truta! And so on. Some "kaudawelsch" that no one understands. No one recognizes the reference? No one? Ok, I'll go in the corner now and rethink my life. My wild guess would be Sudden Strike? Good old WW2 game.